We hope all is good with you! We have been enjoying these rainy days - it has been a long time since we could go out and catch worms in the lawn! This morning we saw a HILARIOUS new commercial - and a Dachshund makes a quick appearance! Don't miss the cute girl. Oh, how we love it. If you have five seconds to spare and need to lighten up your Friday, make sure and head over to the hottest canine site on the net at the moment: Dog Shaming at tumblr, where they "supply your favorite furry friends with a healthy dose of shaming." 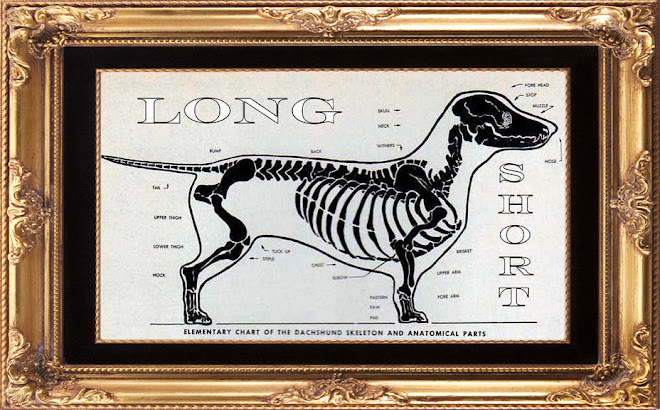 It would figure that the logo for the site, shown above, features a Dachshund - the host of the site is also a Dachshund. The human race is going mad and our hearts are weeping. 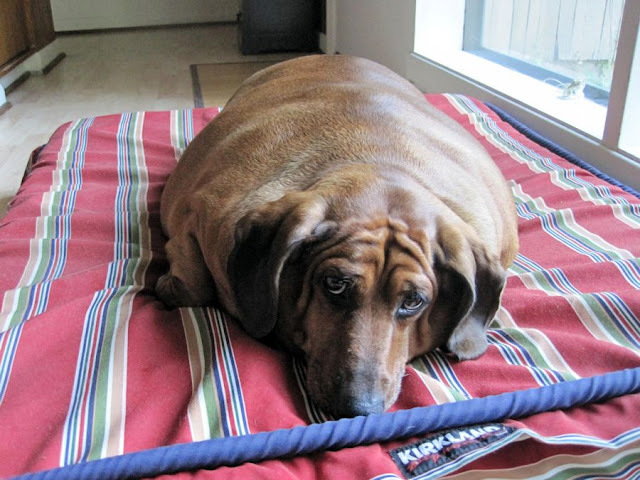 Now, we've seen a lot of Dachshunds over the years, tens of thousands of them, and we have never, EVER, seen such an overweight Dachshund. Why, oh why....we're simply at a loss for words. Our story began when a relative of this boys family stepped in and asked for help. Aging owners with failing health were simply loving him with food. 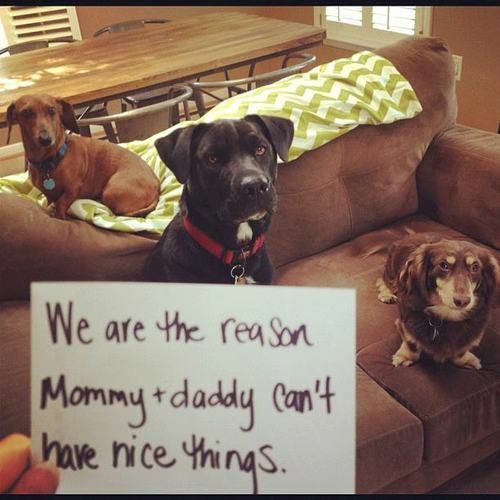 They just couldn't say "no" to those big brown eyes. Through many tears, the owners relinquished him. It is very frustrating and sad but we are thrilled to be able to help him, and now moving on with his new life. I absolutely love your blog! I found it today and can't get enough :) My parents got a mini Dachshund 5 years ago (when I was finishing up high school) and have never looked back. She is a mischievous little girl, often playing tricks on us and smiling when she is happy. 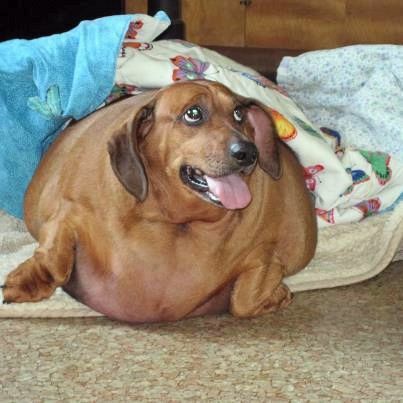 I can't wait to get a Dachshund of my own someday! Thank you for your awesome blog! We love a good Dachshund Photobomb. 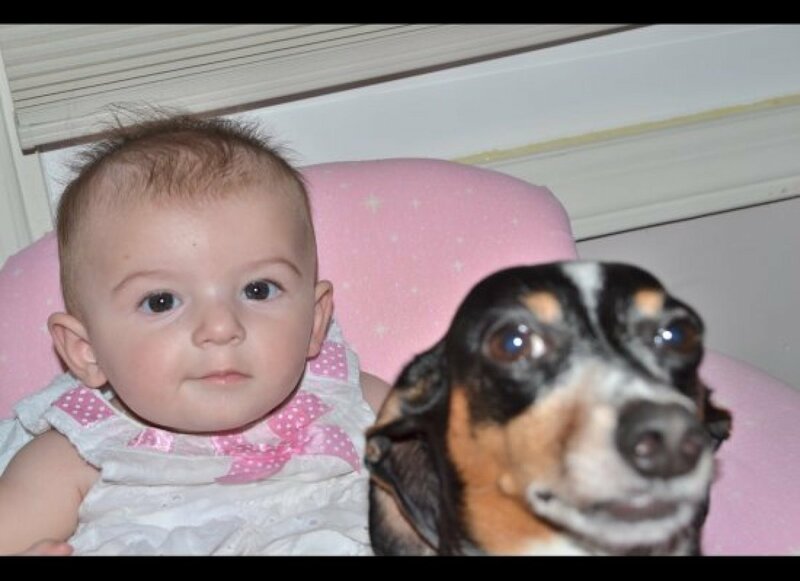 This one was submitted by Melanie Walsh to an article featuring 125 animal photobombs at Huffington Post. Our beloved departed Miss Maggie bombed us once - Dad was taking a photo of a friend's pack of Dachshunds at a MWDR fundraiser, and right when Dad clicked the shutter, Maggie suddenly jumped up into the shot in a "sit pretty" pose. 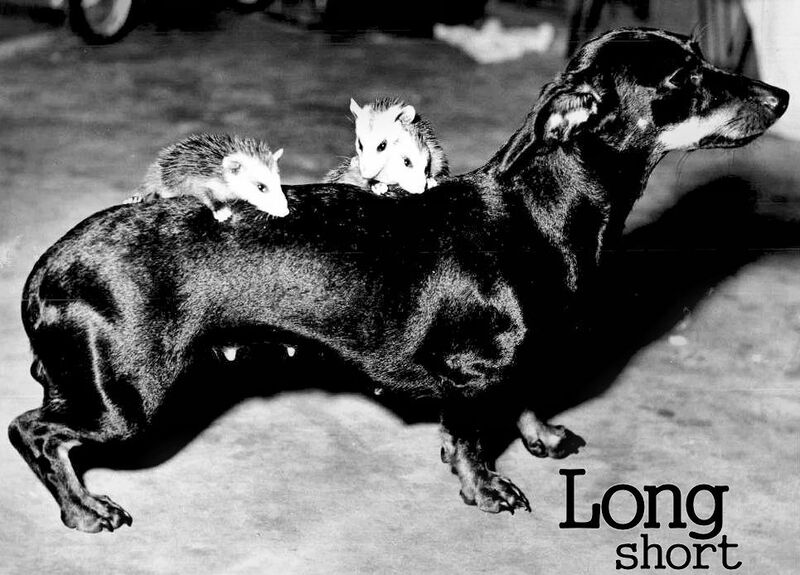 FOR IMMEDIATE RELEASE, April 24, 1967: Possum-Totin' Dachshund: Lady is a Dachshund, who has never had any puppies of her own, but indulges that void in her life by taking care of three motherless possums. 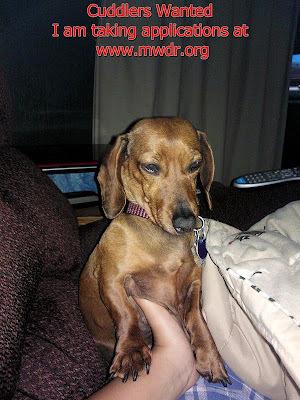 Lady is the family pet of Mr. and Mrs. Joe Waddington, Crystal River, Florida, formerly of St. Petersburg. 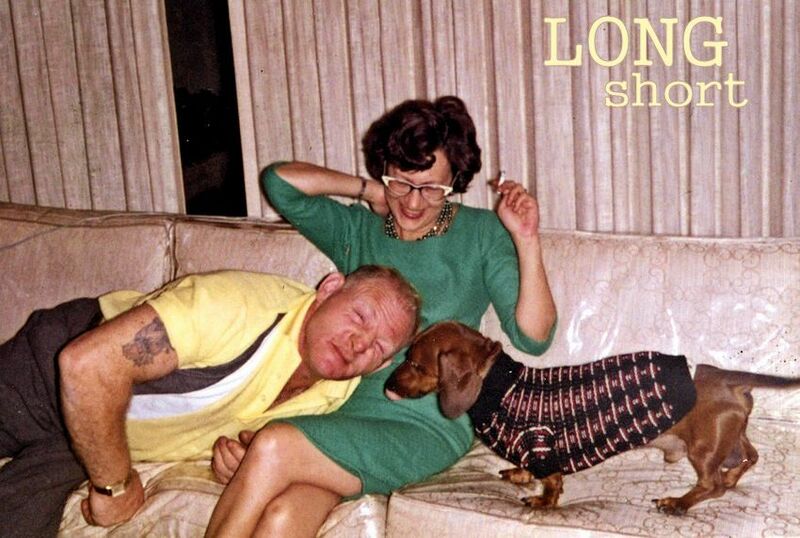 Lady apparently likes this very unusual arrangement. And a wonderful time was had by all, of course. Video by enidnews who detail: Dogs competed Saturday, August 18, 2012, in the 2012 Dachshund Dash in Enid, Okla., to qualify for nationals and to raise money to build mini dog parks at the city of Enid animal shelter. Here is some of the action of the day. I was flipping through the current (Sept) issue of Country Living and noticed that the cover story, on a circa-1850 fixer-upper in Austin, also features several pics of beautiful red Dachshund, Bosco. The pics are really sweet. They sure are! 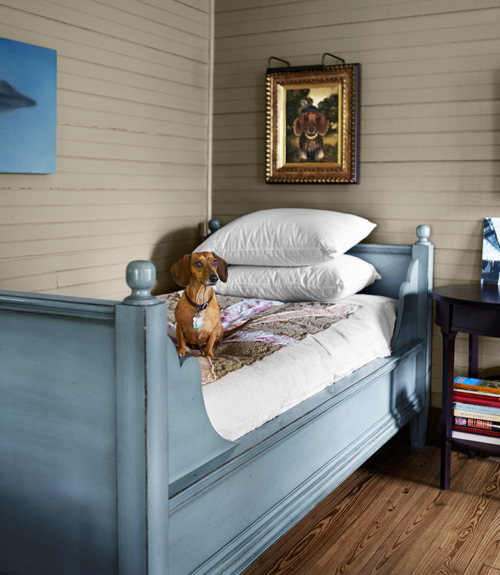 Above, Dachshund Bosco poses in a corner of the master bedroom near his portrait, painted by Martha Bannon. Rachel Ashwell linens and a handmade quilt dress the Pottery Barn daybed. 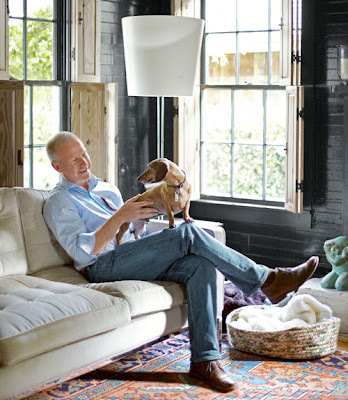 Bosco and one of his humans, Tim Cuppett, relax in the living room, next to double-hung shutters that were crafted from reclaimed pine. "It's a privilege to wake up in this house that existed before us, and will exist after us," he says. No one was hurt in the standoff at the bottled water/convenience store in a residential neighborhood in Sparks, and the badger ultimately was returned to the wild north of Reno, Nevada Department of Wildlife spokesman Chris Healy said. 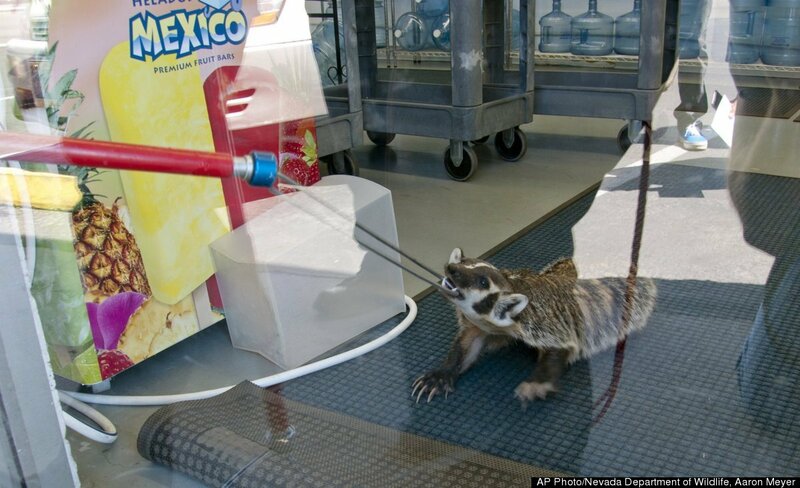 "Obviously it was pretty hungry because when they put the cat food in the trap, it went right in," he said. A state game warden was called to the Fresca Waterstore on Rock Boulevard near Sparks High School along with two assisting officers from Washoe County Animal Services, Healy said. 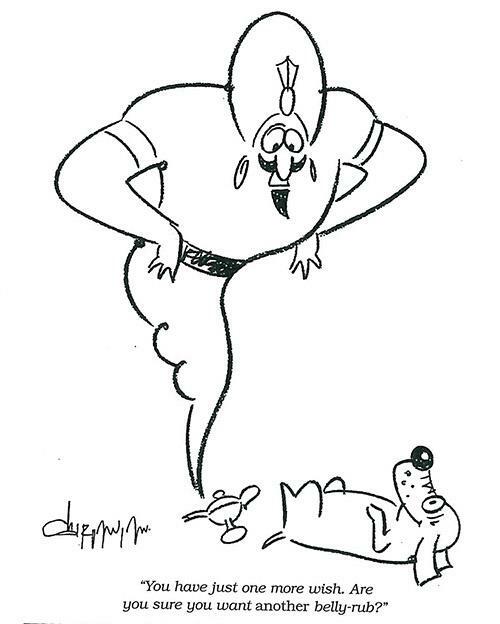 "Some species we can't relocate, we have to euthanize them. 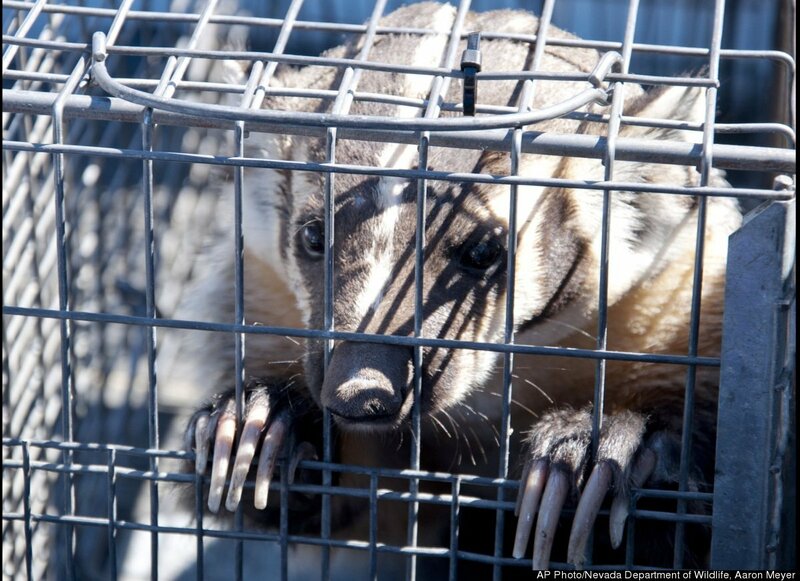 But this one was determined to be OK."
"They are a lot more common than people realize up here but they are nocturnal – they operate at night, and usually not in areas like this," Healy said. "It's the first one I've ever deal with and I've been here 27 years." ....and those teeth. It might be better to just stay under the covers. 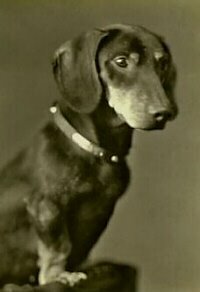 Thanks to an Anonymous Dachshundist for letting us know in the comments that the Mr. Abraham Lincoln and Dachshund photo was courtesy of incredibly handsome 'Old-timey Oscar.' 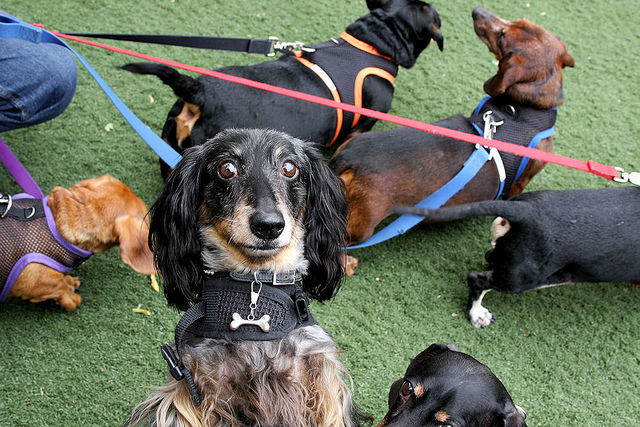 He's the fascinating time-traveling Dachshund at tumblr. Turn up the volume, put on your dancing shoes, and have a great weekend. 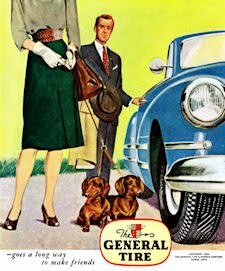 What a great way to spend some quality time with your Dachshund! Meet Crystal Stroud, 26, and her smooth 3-year-old girl 'Polly,' who hail from Mississippi. They are seen here getting some supplies in Harpers Ferry, West Virginia, as they hike the Appalachian Trail from Georgia to Maine this summer. 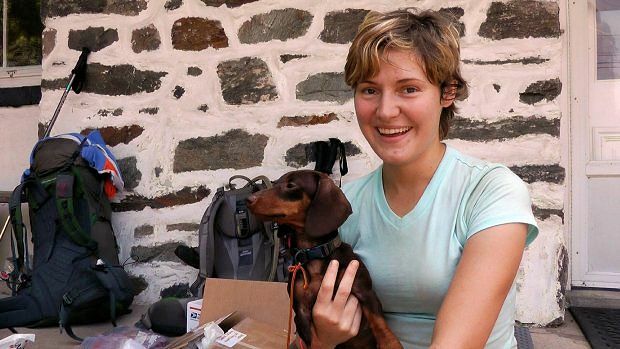 Outside Appalachian Trail Conservancy headquarters in Harpers Ferry, Mississippi native Crystal Stroud, 26, opened boxes of supplies shipped by friends and family – nail clippers and dog food for her trail buddy, a 3-year-old Dachshund named Polly, and wipes, trail mix and a loaf of homemade lemon poppyseed bread for herself. Many rural post offices dot the landscape along the trail, so hikers often ship things to those post offices to pick up as they progress on their journeys. Stroud is hiking north after graduating from Mississippi State University and is craving adventure. 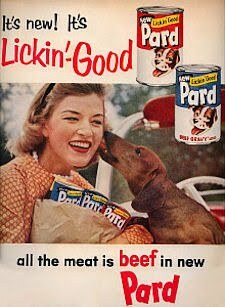 Stroud didn’t realize what she was getting into. She thought she’d camp and hike for a few weeks. At best, she figured, she’d be ready to quit after she saw Tennessee’s Smoky Mountains. Thanks to Elizabeth Romaine for sending in the photo! Coco was an aggressive watchdog, not timid about rushing into the backyard bushes where an intruding skunk sought sanctuary. 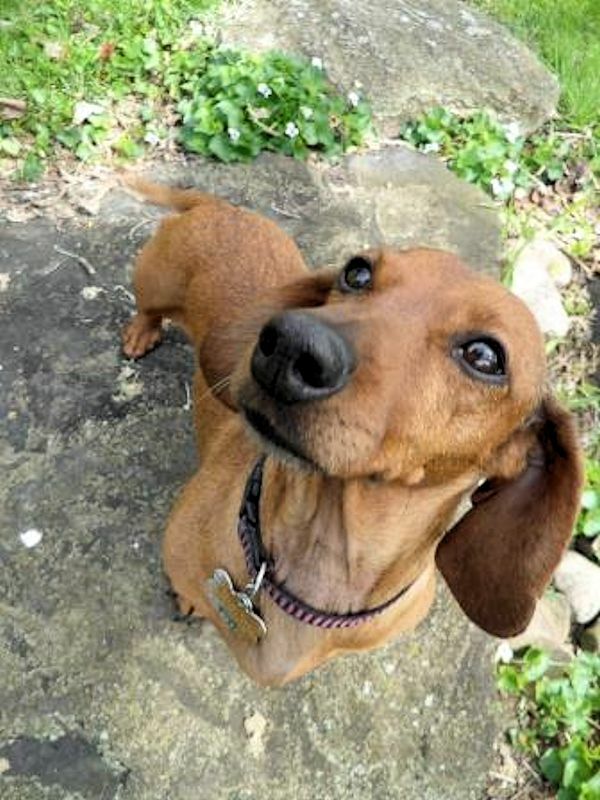 The dog's encounter about 3 a.m. June 12 would result in a scratch on its nose - and lead to the 6-year-old Dachshund's euthanasia three days later. Officials from Long Beach Animal Care Services - also known as Animal Control - say the pet was euthanized because of state law requirements for animals that had not been vaccinated for rabies prior to being injured by a possible rabies carrier. 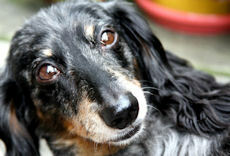 One of the pet's owners countered that the Dachshund had been tested for rabies, and the test results had been negative. "Coco was the family dog," said Robert DeSimone. "We had him since he was 2 months old and were totally devastated to hear that he was killed by Long Beach Animal Control, despite the fact that he tested negative for rabies - and were told by Animal Control he'd only be killed if he was positive for rabies. ... I'm incredibly sad and angry that he's gone now." Animal Control officials said that the dog's blood was tested for signs of rabies to quickly determine whether the skunk was rabid and they needed to locate it. However, the blood tests for rabies are considered unreliable. The only reliable way to check for rabies is to check the animal's brain after death. DeSimone, who lives near El Dorado Park, said Coco had only a minor scratch on the nose. The following night, June 13, DeSimone said he attempted to pet the dog. 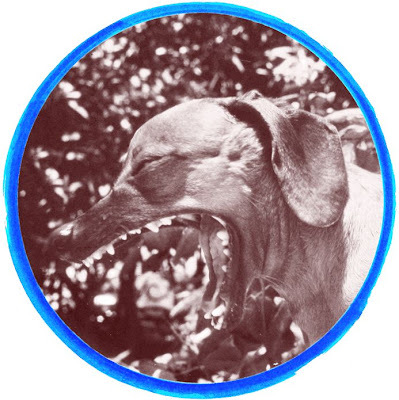 But it growled, prompting a scolding - and that, in turn, spurred the irritated watchdog to bite the scolding finger, the pet owner recalled. DeSimone said the finger was swollen, so he went to Los Alamitos Medical Center for treatment. A staffer called Animal Care Services, which picked up the dog June 14. "I was told (the dog) was going to the quarantined 10 days," DeSimone recalled. 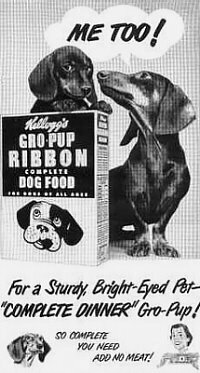 But the following day, June 15, the dog was euthanized, despite blood test results showing it didn't have rabies. Ted Stevens, acting manager for Long Beach Animal Care Services, confirmed the finding, explaining that state law requires the euthanasia of any pet that doesn't have a current rabies vaccination when it is injured by a high-risk animal. 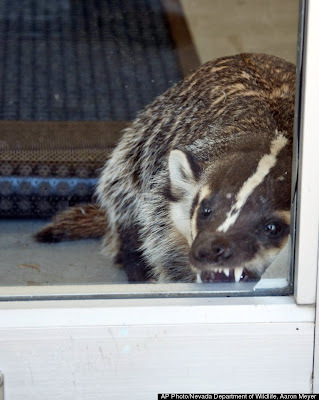 "Since we could not locate or test the skunk, a high risk for rabies, we had to assume the dog was exposed and treat him that way," he explained. 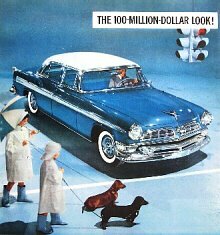 Stevens emphasized the importance of regular vaccinations and licensing your pet. "It would have made all the difference in this case," he said. You can't fight the rabies vaccination laws on the books in every state. Taylor is a sweet 7 year old. She is skittish but once she settles in she loves to snuggle up right next to you. She would be a perfect companion for a quiet family. She has shown some aggression when cornered and scared, so homes with full time small children are not a good choice for her. Taylor is fine with all adults, other dogs, and her demeanor suggests cats would probably be ok too. She is good on a leash, likes going for walks and likes running at the dog park. Taylor has excellent recall, she will come back when you call her. 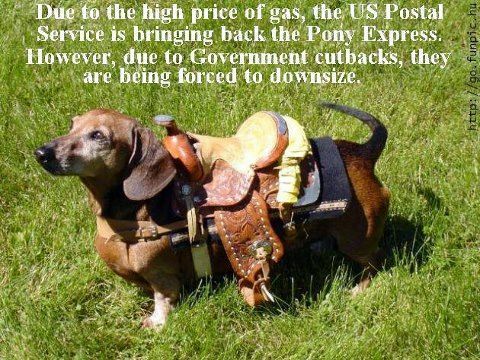 (amazing for a doxie). She`s a sweet funny little girl, who doesn`t mind wearing sweaters or shirts (seems to actually enjoy them) and only wants someone to love her. She seldom barks, even when her foster brothers are barking incessantly. She is fine sleeping at night in her ex pen, is very quiet. She plays with the other dogs occasionally, but her favorite indoor pastime is chewing on rawhides. I think Taylor would like a doggie companion for when your gone, but otherwise she is content to sleep on your lap. 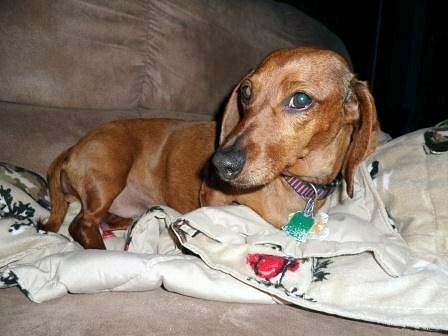 She is typical of doxies and potty training, and as long as you are diligent with taking her out she will go outside. She sleeps while her foster parents are away in the ex pen with a potty pad, and will go on the potty pad if we don't come home soon enough. Taylor was a breeder surrender, and she currently has kidney stones, which requires a daily medication and special prescription food. She was just in for a checkup on 04/10/12 and the stones have dissolved quite a bit, just a bit more until she is totally clear, so it is possible that she may not need the meds and special food forever. If you think you have a place in your heart for Sweet Taylor, please head on over to MidWest Dachshund Rescue. Cute video by youtuber Kyle Jason Lowell who notes: Probably the cutest puppy in the world. This is just a day in the life of our newest mini dachshund pup, Ellie. She's so tiny but has such a huge personality. 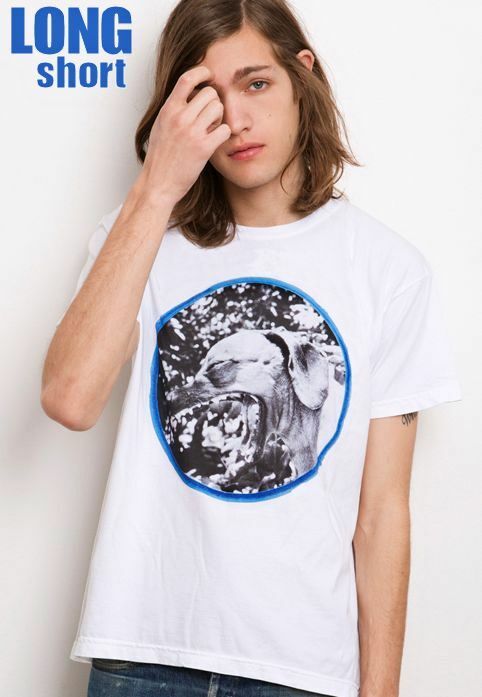 If you're looking for that perfect Dachshund t-shirt that's a little different than the usual "I Heart My Wiener," you can't go wrong with this fashionable "Hot Dog" t-shirt available from Deerdana. At $60, it'll cost you though. 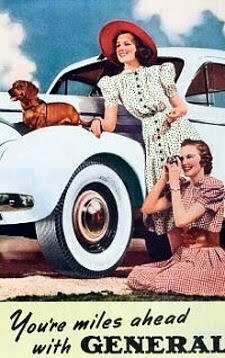 Check out another Dachshund t-shirt they have as well with two Dachshunds on a blanket. Thanks to Andrea Bothum for sending in the link! Yes...we ARE easily amused! Thanks so much to Princess Lea, who hails all the way from Slovenia for sending in the latest Drabble. She says: We love new toys, specially the squeaky ones that we don't get very often due to the fact it drives my dad mad! 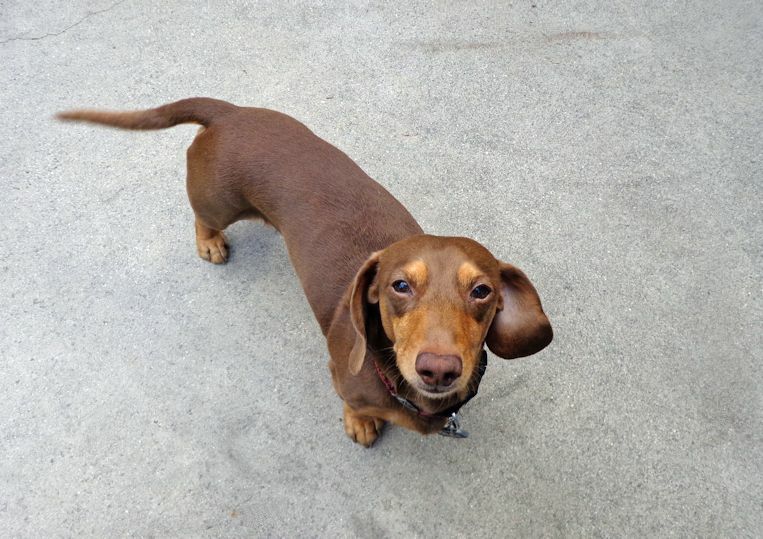 Those Little Smarty-Pants Dachshunds: Meet Hunter! 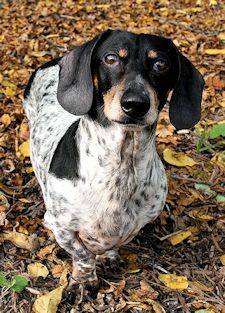 This video by youtuber iamgobbo highlights handsome black and tan smooth 'Oscar' and his new 'Mr. Bill' toy, but what we're really fascinated with, outside of the fact that Oscar's City Dad needs to clean his apartment, is the sheer amount of time it takes to get from Point A to Point B. It's a solid 2.5 minutes to go from the lobby to the apartment. And spending 2.5 minutes to get back to your home is one thing, it's the other way around that really makes us wonder because when you've got to go potty really bad, that 2.5 minutes must seem like 2.5 hours. And lord only knows how far away you have to go once you're outside of the building to find a patch of grass. It's no wonder lots of Dachshunds who live in high rises use pee pads. Standing by as firefighters finished putting out a fire that badly damaged their Martinez home Tuesday afternoon, the Mims family had one big concern on their minds. 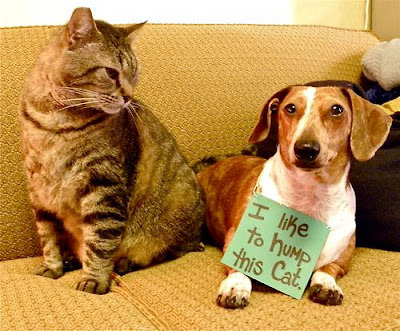 Their 7-year-old Dachshund, Chip, was still unaccounted for. 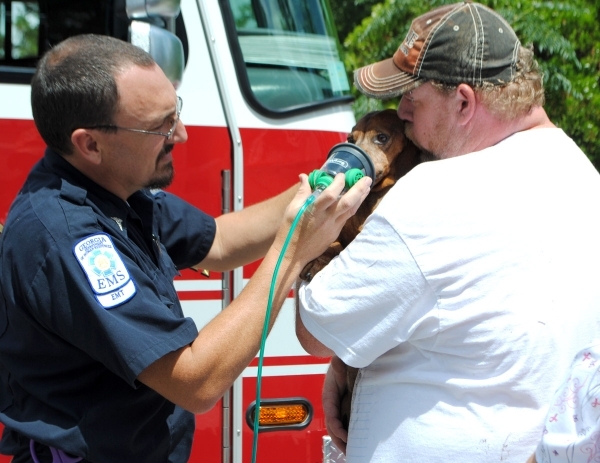 A Gold Cross EMT used a pet oxygen mask on the dog, which appeared only to be shaken up. 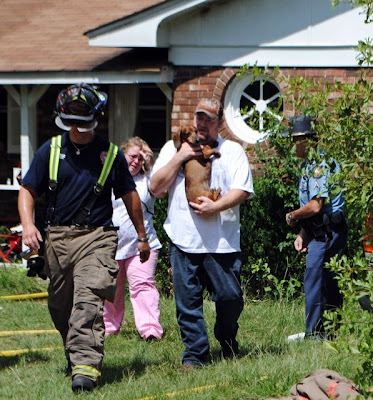 It’s completely destroyed inside,” said James Mims, who feels fortunate his family wasn’t inside when the fire started and his dog was found safe. When firefighters arrived at the home, they saw the back door was open and thought the dog had escaped. “Evidently he was hidden somewhere,” Martinez-Columbia Fire Rescue Battalion Chief Danny Kuhlmann said. 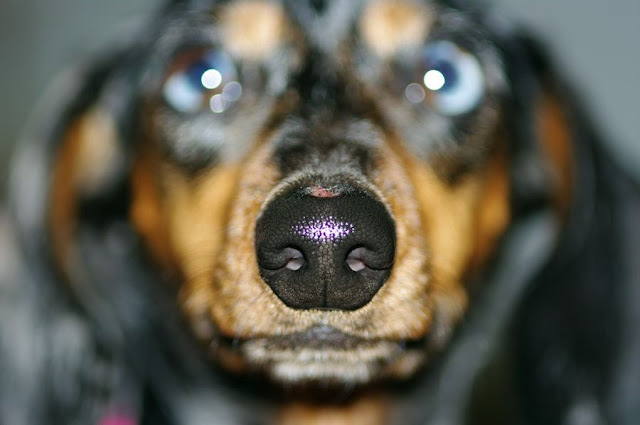 Find out more about pet oxygen masks at the Emma Zen foundation on facebook. 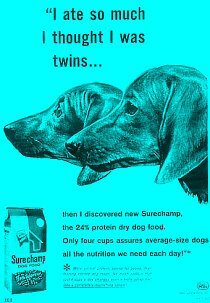 Related: Dachshunds saved using pet oxygen masks. 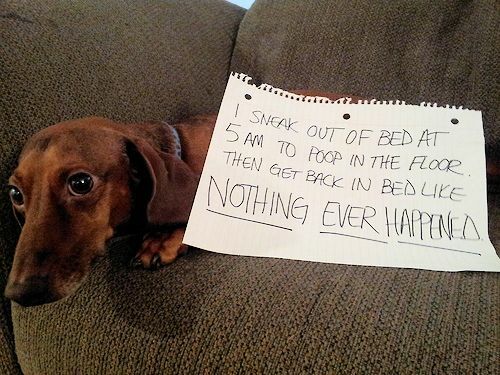 A Dachshund's work is never done, but we love those moments when it all seems to at least be under control. 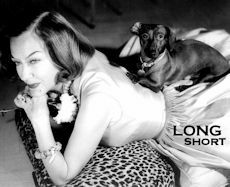 Dachshunds in Pop Culture: Will Joyce MacKenzie Give Up Her Black Velvet? Huh? Joyce MacKenzie (born October 13, 1929 in Redwood City, California) is an American actress who appeared in films and television from 1946 to 1961. She is best remembered for being the eleventh actress to portray Jane. She played the role opposite Lex Barker's Tarzan in 1953's Tarzan and the She-Devil. 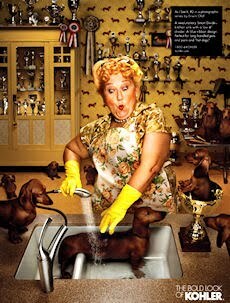 And oh yeah, she was a Dachshund Lover - sort of. 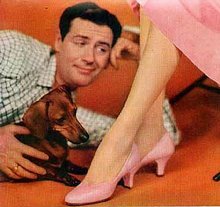 In this press photo and release from July 28, 1953, Ms. MacKenzie is struggling with giving up her Dachshund. How could you say 'Bye" to those eyes? 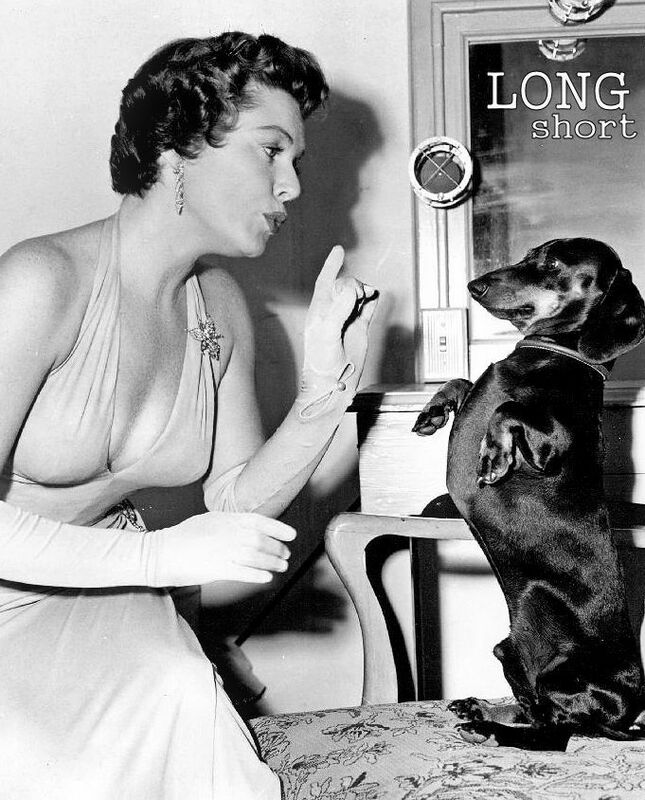 FOR IMMEDIATE RELEASE: A SWITCH ON "LOVE ME, LOVE MY DOG" -- HOLLYWOOD, CALIFORNIA -- "BLACK VELVET" PET DACHSHUND OF ACTRESS JOYCE MACKENZIE PUTS ON HIS MOST APPEALING MANNERS HERE, BUT TO NO AVAIL. THE POOCH IS ON THE LOSING END OF THE "LOVE ME, LOVE MY DOG" PROBLEM. MISS MACKENZIE, RECENT BRIDE OF SOCIALLY PROMINENT TIM LEIMERT IS LOOKING FOR A NEW HOME FOR "VELVET" AFTER SHE DISCOVERED THE POOCH WOULD HAVE NO PART OF EITHER HER BRIDEGROOM OR THE BRIDEGROOM'S COCKER SPANIEL. SO IT'S A NEW HEADQUARTERS FOR VELVET. 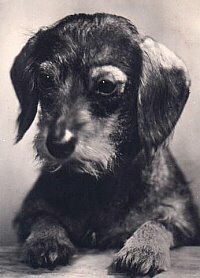 Apparently Black Velvet had good reason to be suspicious, as the MacKenzie-Leimert marriage would last only a few years - proving once again that Dachshund knows best. Cute Dachshund? Check. Dachshund Sweater? Check. Cat Eyes? Check. Cigarette? Check. Tattoo? Check. Plastic Couch Cover? Of course. 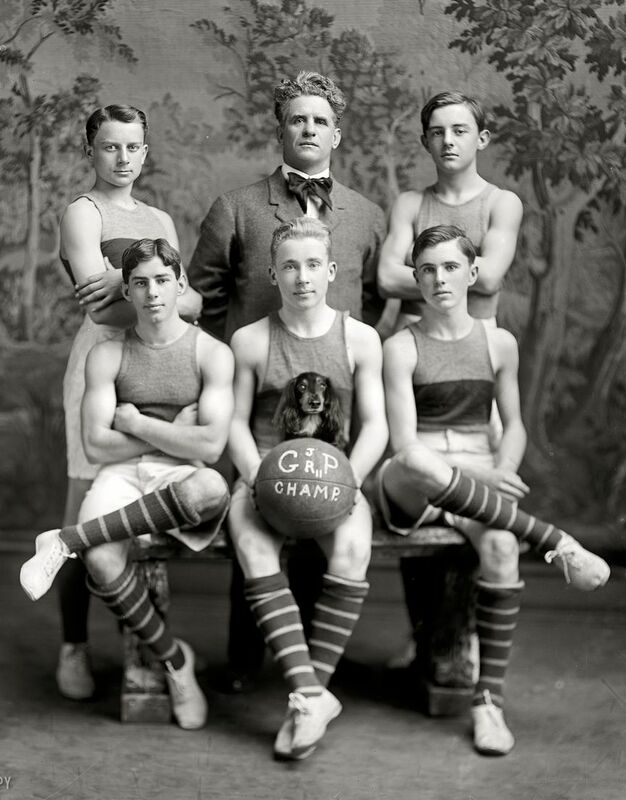 Now,.....who will win the honor of "the lap?" 1960's vintage photo source unknown. UPDATE: See how internet rumors get started? 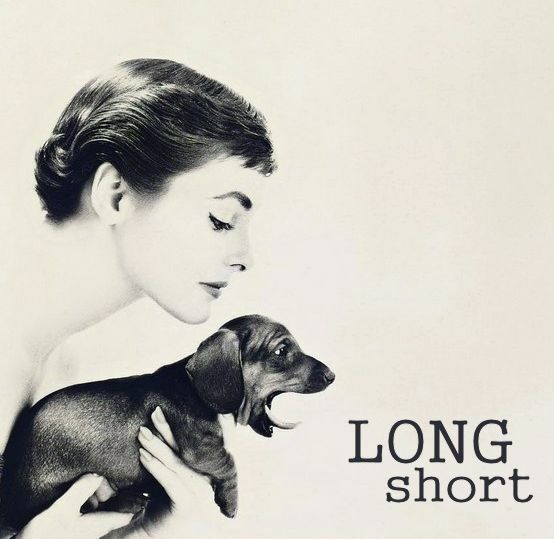 An anonymous Dachshundist sent us this photo of what was claimed to be Audrey Hepburn, and we found the photo on several sites which also suggested that it was Audrey Hepburn. 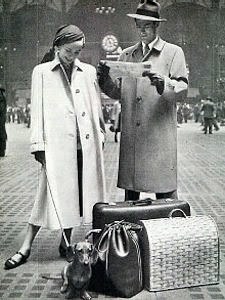 But a little research prompted by an anonymous commenter, which we should have done before we posted it, showed that, no, it is instead Coiffure, for Harper's Bazaar by photographer Lillian Bassman, who passed away earlier this year. Source: Artnet. Regardless, it's a beautiful photo, and we're still going to sing-a-long with Moon River. You've heard Moon River covered a thousand times, even by the likes of REM, but, endulge us, Morrissey covered it best. 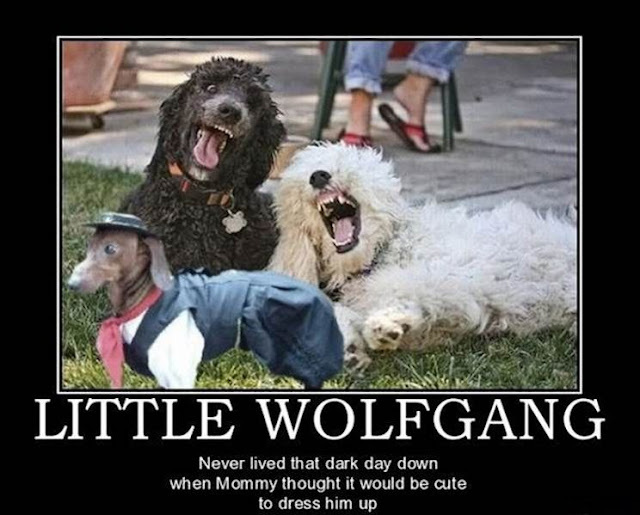 Poor pretty little wirehaired 'Livvy.' She doesn't get to go. Or does she? By youtuber Kanal von Raeubi.